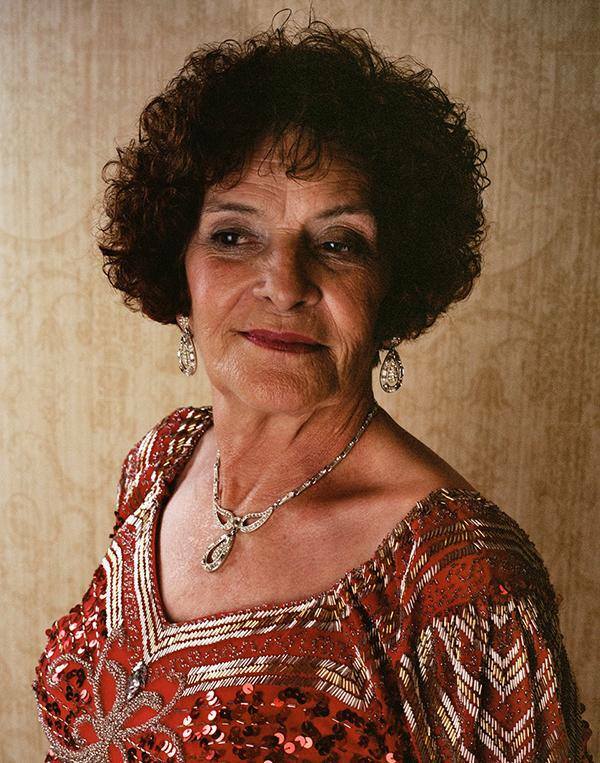 My grandmother became a competitive ballroom dancer twenty years ago, when she was in her seventies, long after most people give up on finding new passions. Through her I discovered a network of women in middle age and beyond who devote their free time to dance competitions across the United States. I visited parties held in dance studios and clubhouses, as well as a large competition in a hotel multipurpose room in Baton Rouge, where I photographed this group of women. Some of the women I met were lifelong dancers; others had taken up the challenge more recently. Rigorously rehearsed and exquisitely dressed, the dancers pictured here are athletes, artists, and – clearly – fashionistas. Much of my photographic work documents female subcultures, exploring the way that women form communities through their politics and passions, and examining how cultural demands on women to look and behave in certain ways inform their identities and appearances. Women over 40 are largely absent from representations of femininity in mass media, disappearing from our visual record as soon as they age out of their supposed prime. Yet the women here are notably, formidably, present in their jewels, sequined gowns, and décolletage. We are used to thinking of dancers as expressing themselves chiefly by moving their bodies. But even stilled in portraits, the faces of these women strike us with the force of their distinct personalities and unconventional beauty. Leah DeVun is an artist and historian living in Brooklyn, New York. Her photographs and installations explore the legacies of feminism -- the landscapes of rural lesbian communes, the drag-like costumes of pre-teen obsessive Hannah Montana fans, the contents of a historic gay and lesbian archive -- with a special interest in queer and gendered communities, fashion and fandom, memory, politics, and identity. Committed to analog/wet-process photography while it lasts, she strives to produce art that is participatory, interdisciplinary, and socially active. Her work has been featured in Artforum, Capricious, LA Weekly, Austin Chronicle, Feministing.com, Gallerist, Artlies, might be good, and No More Potlucks, among other publications, and at venues such as DODGE Gallery, Johannes Vogt Gallery, Martina Johnston Gallery, the ONE Archives Gallery and Museum at the University of Southern California, Otis College of Art and Design, Satellite Space Gallery at the University of Texas San Antonio, Centraltrak at the University of Texas Dallas, Sage Art Center at the University of Rochester, the Houston Center for Photography, Arthouse-Austin Museum of Art, and the Elizabeth A. Sackler Center for Feminist Art at the Brooklyn Museum. She's written for Wired, Radical History Review, GLQ, and Spot, appeared on a track of a Le Tigre album, and served as a commentator on the DVD of the Showtime TV series "The L Word." DeVun teaches women's and gender history at Rutgers University and was a faculty fellow at Stanford University in 2011-12. The act of crocheting cannot be separated from my memories of personal history. My grandmother taught me how to crochet when I was young and I have worked with this craft throughout my life. Crochet brings to mind hours of labor, societal histories, and concepts of comfort and warmth. I find solace, both for myself personally, and projected onto the objects I am covering through the slow repetitive process. Recently I have begun combining those ideas with concepts of ceremony and the human form. I am interested in hiding oneself in plain sight. Through concealing my body with masks and props, I am revealing alternate narratives. Donning a costume you can invent a new identity. Taking clues from indigenous cultures and ceremonial clothing, I am telling stories through photographic images. I think of myself as both the shaman and the anthropologist, revealing the narrative of my own mythical culture. In the same way I am covering myself with masks, I am concealing the faces of the figurines and the subjects in the photos. By taking away personal identity I am giving them more of a universal reality. Through all the concealing I believe I am ultimately revealing my true self. Elaine Bradford lives and works in Houston, TX. She holds an MFA from the California Institute of the Arts (2003) and a BFA from the University of Texas at Austin (2000). Her work has been included in shows at Hyde Park Art Center in Chicago, IL; Jenkins Johnson Gallery, New York, NY; Handmade in America Gallery in Asheville, NC; and Centre Culturel Aragon in Oyonnax, France. Select solo shows have been at The Picture Gallery at Saint Gaudens Memorial, Cornish, NH; ArtLeague Houston, Houston, TX; and Hunt Gallery at Webster University, St. Louis, MO. She is a founding member BOX 13 ArtSpace, an innovative artist run studio and gallery space in Houston. She was a resident artist at the Houston Center for Contemporary Craft in 2010. In 2011 she completed a permanent civic art commission for the City of Houston at Vinson Neighborhood Library. Bradford is represented by Art Palace Gallery in Houston, TX. Architecture and pathways that make up our urban environment influence my work. I am inspired by visual structures, systems, and signals that direct us through life, and this movement is indicated within my compositions by directional symbols, lines of motion, and a dynamic angular understanding of city landscapes. Plexiglas paintings invite viewers to move around and animate a complex balance of color and line as they circle the object. Two and three dimensions are kept and at play. Jonathan Leach is a painter/sculptor currently living and working in Houston, Texas. After receiving a BFA from The School of the Art Institute of Chicago in 2001, Jonathan continues to explore the language of architecture, advertising, and traffic in his abstract works. Jonathan has had solo shows at Gallery Sonja Roesch, the Galveston Arts Center and galleryHOMELAND. His work is also in the collections of NRG Texas, Hess Co., the Bank of Montreal, and Hobby Airport of Houston, and the Museum of Fine Arts Houston. Our lives become folklore, as each time a memory is recalled, it is rewritten. Emily Link works expand upon existing myths and legends to create another dimensional layer that stems from her life experiences. In these legends, she acts as Shaman; the expert of their origins. Link’s work is part of an ongoing series of works dedicated to the excavation and reinterpretation of personal narratives through the employment of soft sculpture forms, illustrative drawings, and handcrafted artifacts. Most recently Link has employed the use of three central characters to illustrate different stages inside a single narrative. Within each stage, she creates tools, clothing and environments for the figures. Through the combination of existing lore from cultures worldwide, and personal adventures, the installations are presented to the audience as a story that, through it’s specificity, becomes universal language. Her work is influenced by the supernatural and the tradition of storytelling, literary works and educational texts. Born in Syracuse, NY, in 1985 and raised in rural Pennsylvania, Emily Link spent her youth immersed in wilderness, remnants of the Civil War and Native American legend. Since being transplanted to Texas, she has worked to build an enriched cultural past in an environment that exists only for the future. In 2008 she received her BFA from the University of Houston. Emily Link is currently based in Houston, TX, working from her studio at BOX13 ArtSpace.